Warren is in its third round of online courses using our course provider Apex Learning. During the Fall 2014 semester there are eight sections of courses ranging from senior English to Economics. There are 166 students enrolled in these courses with some taking more than one course for a total enrollment of 188 students seeking first time credit. World Wide Warren, the name for our virtual learning programs, also includes new approaches to credit recovery and to alternative education. Several hundred students are also taking advantage of online content in the traditional classroom setting where teachers are using the Apex content to augment their lessons and support student learning needs. World Wide Warren Credit Recovery provides students at Warren Central High School with a flexible option for recovering credits so that they can get back on track of on-time graduation. Renaissance provides students with a flexible online curriculum for gaining initial credit and for recovering credits so that they can be on track for on-time graduation. Extended Learning Opportunities (ELO) continue to be creative, personal, and often inspiring ways for students to earn extra credits outside of the traditional classroom while demonstrating proficiency and mastery of course competencies. Last year, 117 students were positively impacted by an Extended Learning Opportunity— and each ELO was as unique as the individual student. 38.5 credits were awarded over a diverse array of subjects and areas of interest, such as foreign language, health, manufacturing, business, statistics, psychology and philosophy, and fine arts. While some students completed internships, others participated in job shadowing experiences, or independent studies. Others opted to complete an ELO as a team—and all worked with dedicated community partners. This year promises to build on the success of last year. To date ELO’s “under construction” indicate a potential of 49 credits! We are also fostering relationships with new community partners in an effort to add additional ELO opportunities for our students. All students who have or think they have a desire to learn more about a career interest are encouraged to explore the possibilities of completing an ELO. Students should contact their teacher or Mrs. Banks at jbanks3@warren.k12.in.us for more information. Visit their website. 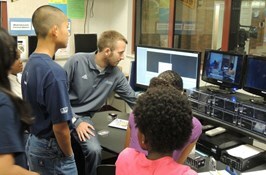 FrontRunner Media Productions is an innovative program that represents a unique collaboration between business and education. With state of the art media production facilities and resources made possible through the Race To The Top grant, FrontRunner provides our students with opportunities to work with professionals on actual, real world projects.